Intermediate. One of the most important exercises one can attempt in jazz is to play tunes in all twelve keys. But often, this seems mysteriously difficult - Where do you begin? How can you hear the changes in those ""odd"" keys? 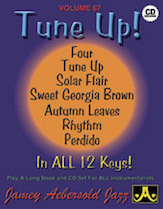 Now anyone can do it with this fantastic Play-A-Long of 7 easy to medium difficulty songs in all twelve keys! The professional rhythm section provides the energy to really inspire you, and is absolutely rock solid. The first chorus for each tune is in the standard (original) key, followed by choruses in the 11 other keys.